My wife has suggest that i should display my Artwork a little more, she says that by having your work only in your computer is truly a waste and I should upload them to my art site. Currently I am just about half way. Sold an artwork today, a lady saw “Little Blue” a few months ago and today she came to my work and asked to purchase it. This one has been in a few art shows and I had many great response to it, this one was done in a teardrop style brush stroke. If you want to see a larger image of some of my artwork click on the Entries RSS, then click on the jpg files to view large images. Some jpgs my be in only one format. 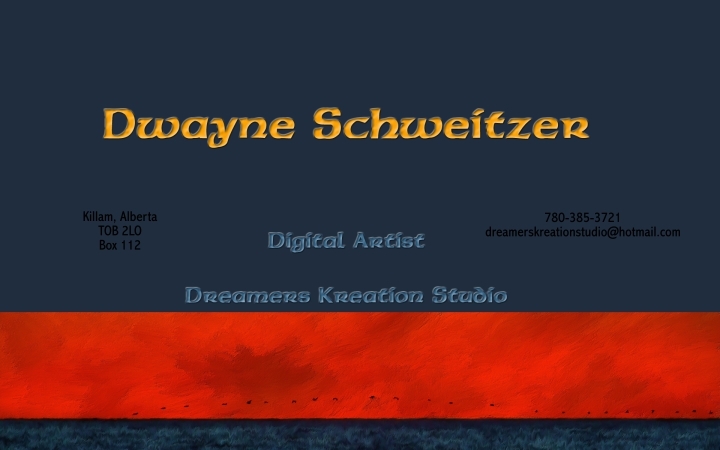 New to world of blogging, My name is Dwayne Schweitzer and I’m a digital artist that lives in a small town in Alberta, Canada called Killam. I have been doing art for about the last 3 years and I have been having a ball.